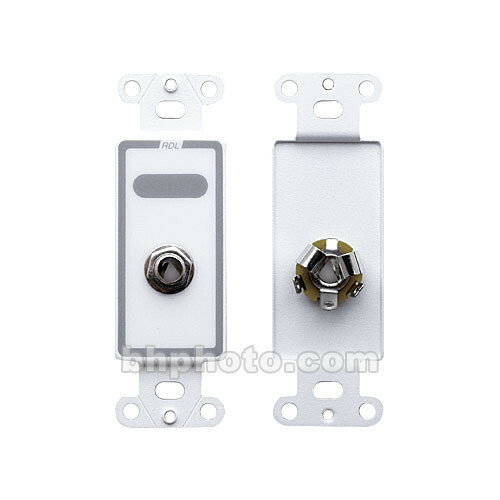 The D-1-4F Female 1/4" Phone Jack on D Plate (Solder Type) from RDL is a D-style connecter plate with (1) female 1/4" phone jack. This unit can be mounted in WB-1U and WB-2U Universal Wall Boxes. This unit and the wall box it is mounted in can be covered by a CP-1 or CP-2 cover plate to achieve a clean aesthetic look. This D-style connecter plate features (1) female 1/4" phone jack. This plate is designed for use with WB-1U and WB-2U Universal Wall Boxes. To achieve a clean finished look, this unit and the wall box it is mounted in can be covered by a CP-1 or CP-2 cover plate.